Having finished our analysis of the Congress debates and voting, we must now sum up, so that we may, on the basis of the entire Congress material, answer the question: what elements, groups, and shades went to make up the final majority and minority which we saw in the elections and which were destined for a time to become the main division in our Party? A summary must be made of all the material relating to shades of principle, theoretical and tactical, which the minutes of the Congress provide in such abundance. Without a general “resumé” without a general picture of the Congress as a whole, and of all the principal groupings during the voting, this material is too disjointed, too disconnected, so that at first sight the individual groupings seem accidental, especially to one who does not take the trouble to make an independent and comprehensive study of the Congress Minutes (and how many readers have taken that trouble?). In English parliamentary reports we often meet the characteristic word “division”. The House “divided” into such and such a majority and minority, it is said when an issue is voted. The “division” of our Social-Democratic House on the various issues discussed at the Congress presents a picture of the struggle within the Party, of its shades of opinion and groups, that is unique of its kind and unparalleled for its completeness and accuracy. To make the picture a graphic one, to obtain a real picture instead of a heap of disconnected, disjointed, and isolated facts and incidents, to put a stop to the endless and senseless arguments over particular votings (who voted for whom and who supported whom? ), I have decided to try to depict all the basic types of “divisions” at our Congress in the form of a diagram. This will probably seem strange to a great many people, but I doubt whether any other method can be found that would really generalise and summarise the results in the most complete and accurate manner possible. Which way a particular delegate voted can be ascertained with absolute accuracy in cases when a roll-call vote was taken; and in certain important cases when no roll-call vote was taken it can be determined from the minutes with a very high degree of probability, with a sufficient degree of approximation to the truth. And if we take into account all the roll-call votes and all the other votes on issues of any importance (as judged, for example, by the thoroughness and warmth of the debates), we shall obtain the most objective picture of our inner Party struggle that the material at our disposal permits. In doing so, instead of giving a photograph, i.e., an image of each voting separately, we shall try to give a picture, i.e., to present all the main types of voting, ignoring relatively unimportant exceptions and variations which would only confuse matters. In any case, anybody will be able with the aid of the minutes to check every detail of our picture, to amplify it with any particular voting he likes, in short, to criticise it not only by arguing, expressing doubts, and making references to isolated incidents, but by drawing a different picture on the basis of the same material. In marking on the diagram each delegate who took part in the voting, we shall indicate by special shading the four main groups which we have traced in detail through the whole of the Congress debates, viz., 1) the Iskra-ists of the majority; 2) the Iskra-ists of the minority; 3) the “Centre”, and 4) the anti-Iskra-ists. We have seen the difference in shades of principle between these groups in a host of instances, and if anyone does not like the names of the groups, which remind lovers of zigzags too much of the Iskra organisation and the Iskra trend, we can tell them that it is not the name that matters. Now that we have traced the shades through all the debates at the Congress, it is easy to substitute for the already established and familiar Party appellations (which jar on the ears of some) a characterisation of the essence of the shades between the groups. Were this substitution made, we would obtain the following names for these same four groups: 1) consistent revolutionary Social-Democrats; 2) minor opportunists; 3) middling opportunists; and 4) major opportunists (major by our Russian standards). Let us hope that these names will be less shocking to those who have latterly taken to assuring themselves and others that Iskra-ist is a name which only denotes a “circle”, and not a trend. This type of voting provides the answer to a very interesting and important question, namely, when did the Congress “Centre” vote with the Iskra-ists? It was either when the anti-“Iskra”-ists, too, were with us, with a few exceptions (adoption of the programme, or endorsement of Iskra without motives stated), or else when it was a question of the sort of statement which was not in itself a direct committal to a definite political position (recognition of Iskra’s organising work was not in itself a committal to carry out its organisational policy in relation to particular groups; rejection of the principle of federation did not preclude abstention from voting on a specific scheme of federation, as we have seen in the case of Comrade Makhov). We have already seen, when speaking of the significance of the groupings at the Congress in general, how falsely this matter is put in the official account of the official Iskra;, which (through the mouth of Comrade Martov) slurs and glosses over the difference between the Iskra-ists and the “Centre”, between consistent revolutionary Social-Democrats and opportunists, by citing cases when the anti-“Iskra”-ists, too, voted with us! Even the most “Right-wing” of the opportunists in the German and French Social-Democratic parties never vote against such points as the adoption of the programme as a whole. The second type of voting (B) covers the cases when the Iskra-ists, consistent and inconsistent, voted together against all the anti-Iskra-ists and the entire “Centre”. These were mostly cases that involved giving effect to definite and specific plans of the Iskra policy, that is, endorsing Iskra in fact and not only in word. 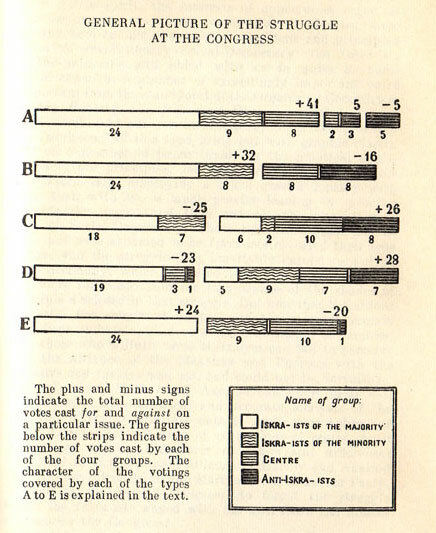 They include the Organising Committee incident;  It is this vote that is depicted in Diagram B; the Iskra-ists secured thirty-two votes, the Bundist resolution sixteen. It should be pointed out that of the votes of this type not one was by roll-call. The way the individual delegates voted can only be established—but with a very high degree of probability—by two sets of evidence: 1) in the debate the speakers of both groups of Iskra-ists spoke in favour those of the anti-Iskra-ists and the “Centre” against; 2) the number of votes cast in favour was always very close to thirty-three. Nor should it be forgotten that when analysing the Congress debates we pointed out, quite apart from the voting, a number of cases when the “Centre” sided with the anti-Iskra-ists (the opportunists) against us. Some of these issues were: the absolute value of democratic demands, whether we should support the oppositional elements, restriction of centralism, etc. —Lenin the question of making the position of the Bund in the Party the first item on the agenda; the dissolution of the Yuzhny Rabochy group; two votes on the agrarian programme, and, sixthly and lastly, the vote against the Union of Russian Social-Democrats Abroad (Rabocheye Dyelo), that is, the recognition of the League as the only Party organisation abroad. The old, pre-Party, circle spirit, the interests of opportunist organisations or groups, the narrow conception of Marxism were fighting here against the strictly consistent and principled policy of revolutionary Social-Democracy; the Iskra-ists of the minority still sided with us in quite a number of cases, in a number of exceedingly important votes (important from the standpoint of the Organising Committee, Yuzhny Rabochy, and Rabocheye Dyelo) . . . until their own circle spirit and their own inconsistency came into question. The “divisions” of this type bring out with graphic clarity that on a number of issues involving the practical application of our principles, the Centre joined forces with the anti-“Iskra”-ists, displaying a much greater kinship with them than with us, a much greater leaning in practice towards the opportunist than towards the revolutionary wing of Social-Democracy. Those who were Iskra-ists in name but were ashamed to be Iskra-ists revealed their true nature, and the struggle that inevitably ensued caused no little acrimony, which obscured from the less thoughtful and more impressionable the significance of the shades of principle disclosed in that struggle. But now that the ardour of battle has somewhat abated and the minutes remain as a dispassionate extract of a series of heated encounters, only those who wilfully close their eyes can fail to perceive that the alliance of the Makhovs and Egorovs with the Akimovs and Liebers was not, and could not be, fortuitous. The only thing Martov and Axelrod can do is keep well away from a comprehensive and accurate analysis of the minutes, or try at this late date to undo their behaviour at the Congress by all sorts of expressions of regret. As if regrets can remove differences of views and differences of policy! As if the present alliance of Martov and Axelrod with Akimov, Brouckère, and Martynov can cause our Party, restored at the Second Congress, to forget the struggle which the Iskra-ists waged with the anti-Iskra-ists almost throughout the Congress! And now, with the aid of the objective evidence of votes of every type, let us sum up the results of the Congress. There has been much talk to the effect that the majority at our Congress was “accidental”. This, in fact, was Comrade Martov’s sole consolation in his Once More in the Minority. The diagram clearly shows that in one sense, but in only one, the majority could be called accidental, viz., in the sense that the withdrawal of the seven most opportunist delegates of the "Right " was—supposedly—a matter of accident. To the extent that this withdrawal was an accident (and no more), our majority was accidental. A mere glance at the diagram will show better than any long arguments on whose side these seven would have been, were bound to have been. We shall see later that after the Congress both Comrade Akimov and the Voronezh Committee, which has the closest kinship with Comrade Akimov, explicitly expressed their sympathy with the “minority”. —Lenin But the question is: how far was the withdrawal of the seven really an accident? That is a question which those who talk so freely about the “accidental” character of the majority do not like to ask themselves. It is an unpleasant question for them. Was it an accident that the most extreme representatives of the Right and not of the Left wing of our Party were the ones to withdraw? Was it an accident that it was opportunists who withdrew, and not consistent revolutionary Social-Democrats? Is there no connection between this “accidental” withdrawal and the struggle against the opportunist wing which was waged throughout the Congress and which stands out so graphically in our diagram? One has only to ask these questions, which are so unpleasant to the minority, to realise what fact all this talk about the accidental character of the majority is intended to conceal. It is the unquestionable and incontrovertible fact that the minority was formed of those in our Party who gravitate most towards opportunism. The minority was formed of those elements in the Party who are least stable in theory, least steadfast in matters of principle. It was from the Right wing of the Party that the minority was formed. The division into majority and minority is a direct and inevitable continuation of that division of the Social-Democrats into a revolutionary and an opportunist wing, into a Mountain and a Gironde, which did not appear only yesterday, nor in the Russian workers’ party alone, and which no doubt will not disappear tomorrow. This fact is of cardinal importance for elucidating the causes and the various stages of our disagreements. Whoever tries to evade the fact by denying or glossing over the struggle at the Congress and the shades of principle that it revealed, simply testifies to his own intellectual and political poverty. And in order to disprove the fact, it would have to be shown, in the first place, that the general picture of the voting and “divisions” at our Party Congress was different from the one I have drawn; and, in the second place, that it was the most consistent revolutionary Social-Democrats, those who in Russia have adopted the name of Iskra-ists,  Note for Comrade Martov’s benefit. If Comrade Martov has now forgotten that the term “Iskra”-ist implies the follower of a trend and not a member of a circle, we would advise him to read in the Congress Minutes the explanation Comrade Trotsky gave Comrade Akimov on this point. There were three Iskra-ist circles (in relation to the Party) at the Congress: the Emancipation of Labour group, the Iskra editorial board, and the Iskra organisation. Two of these three circles had the good sense to dissolve themselves; the third did not display enough Party spirit to do so, and was dissolved by the Congress. The broadest of the Iskra-ist circles, the Iskra organisation (which included the editorial board and the Emancipation of Labour group), had sixteen members present at the Congress in all, of whom only eleven were entitled to vote. Iskra-ists by trend, on the other hand, not by membership in any Iskra-ist “circle”, numbered, by my calculation, twenty-seven, with thirty-three votes. Hence, less than half of the Iskra-ists at the Congress belonged to Iskra-ist circles. —Lenin who were in the wrong on the substance of all those issues over which the Congress “divided”. Well, just try to show that, gentlemen! Incidentally, the fact that the minority was formed of the most opportunist, the least stable and consistent elements of the Party provides an answer to those numerous objections and expressions of doubt which are addressed to the majority by people who are imperfectly acquainted with the matter, or have not given it sufficient thought. Is it not petty, we are told, to account for the divergence by a minor mistake of Comrade Martov and Comrade Axelrod? Yes, gentlemen, Comrade Martov’s mistake was a minor one (and I said so even at the Congress, in the heat of the struggle); but this minor mistake could (and did ) cause a lot of harm because Comrade Martov was pulled over to the side of delegates who had made a whole series of mistakes, had manifested an inclination towards opportunism and inconsistency of principle on a whole series of questions. That Comrade Martov and Comrade Axelrod should have displayed instability was an unimportant fact concerning individuals; it was not an individual fact, however, but a Party fact, and a not altogether unimportant one, that a very considerable minority should have been formed of all the least stable elements, of all who either rejected Iskra’s trend altogether and openly opposed it, or paid lip service to it but actually sided time and again with the anti-Iskra-ists. Is it not absurd to account for the divergence by the prevalence of an inveterate circle spirit and revolutionary philistinism in the small circle comprised by the old Iskra editorial board? No, it is not absurd, because all those in our Party who all through the Congress had fought for every kind of circle, all those who were generally incapable of rising above revolutionary philistinism, all those who talked about the “historical” character of the philistine and circle spirit in order to justify and preserve that evil, rose up in support of this particular circle. The fact that narrow circle interests prevailed over the Party interest in the one little circle of the Iskra editorial board might, perhaps, be regarded as an accident; but it was no accident that in staunch support of this circle rose up the Akimovs and Brouckères, who attached no less (if not more) value to the “historical continuity” of the celebrated Voronezh Committee and the notorious St. Petersburg “Workers’ Organisation”; the Egorovs, who lamented the “murder” of Rabocheye Dyelo as bitterly as the “murder” of the old editorial board (if not more so); the Makhovs, etc., etc. You can tell a man by his friends—the proverb says. And you can tell a man’s political complexion by his political allies, by the people who vote for him. Taken by itself, there was nothing dreadful, nor critical, nor even anything abnormal in the fact that the Congress (and the Party) divided into a Left and a Right, a revolutionary and an opportunist wing. On the contrary, the whole past decade in the history of the Russian (and not only the Russian) Social-Democratic movement had been leading inevitably and inexorably to such a division. The fact that the division took place over a number of very minor mistakes of the Right wing, of (relatively) very unimportant differences (a fact which seems shocking to the superficial observer and to the philistine mind), marked a big step forward for our Party as a whole. Formerly we used to differ over major issues, such as might in some cases even justify a split; now we have reached agreement on all major and important points, and are only divided by shades, about which we may and should argue, but over which it would be absurd and childish to part company (as Comrade Plekhanov has quite rightly said in his interesting article “What Should Not Be Done”, to which we shall revert). Now, when the anarchistic behaviour of the minority since the Congress has almost brought the Party to a split, one may often hear wiseacres saying: Was it worth while fighting at the Congress over such trifles as the Organising Committee incident, the dissolution of the Yuzhny Rabochy group or Rabocheye Dyelo, or Paragraph 1, or the dissolution of the old editorial board, etc.? Those who argue in this way are in fact introducing the circle standpoint into Party affairs: a struggle of shades in the Party is inevitable and essential, as long as it does not lead to anarchy and splits, as long as it is confined within bounds approved by the common consent of all comrades and Party members. And our struggle against the Right wing of the Party at the Congress, against Akimov and Axelrod, Martynov and Martov, in no way exceeded those bounds. One need only recall two facts which incontrovertibly prove this: 1) when Comrades Martynov and Akimov were about to quit the Congress, we were all prepared to do everything to obliterate the idea of an “insult”; we all adopted (by thirty-two votes) Comrade Trotsky’s motion inviting these comrades to regard the explanations as satisfactory and withdraw their statement; 2) when it came to the election of the central bodies, we were prepared to allow the minority (or the opportunist wing) of the Congress a minority on both central bodies: Martov on the Central Organ and Popov on the Central Committee. We could not act otherwise from the Party standpoint, since even before the Congress we had decided to elect two trios. If the difference of shades revealed at the Congress was not great, neither was the practical conclusion we drew from the struggle between these shades: the conclusion amounted solely to this, that two-thirds of the seats on both bodies of three ought to be given to the majority at the Party Congress. It was only the refusal of the minority at the Party Congress to be a minority on the central bodies that led first to the “feeble whining” of defeated intellectuals, and then to anarchistic talk and anarchistic actions. In conclusion, let us take one more glance at the diagram from the standpoint of the composition of the central bodies. Quite naturally, in addition to the question of shades, the delegates were faced during the elections with the question of the suitability, efficiency, etc., of one or another person. The minority are now very prone to confuse these two questions. Yet that they are different questions is self-evident, and this can be seen from the simple fact, for instance, that the election of an initial trio for the Central Organ had been pIanned even before the Congress, at a time when no one could have foreseen the alliance of Martov and Axelrod with Martynov and Akimov. Different questions have to be answered in different ways: the answer to the question of shades must be sought for in the minutes of the Congress, in the open discussions and voting on each and every issue. As to the question of the suitability of persons, everybody at the Congress had decided that it should be settled by secret ballot. Why did the whole Congress unanimously take that decision? The question is so elementary that it would be odd to dwell on it. But (since their defeat at the ballot-box) the minority have begun to forget even elementary things. We have heard torrents of ardent, passionate speeches, heated almost to the point of irresponsibility, in defence of the old editorial board, but we have heard absolutely nothing about the shades at the Congress that were involved in the struggle over a board of six or three. We hear talk and gossip on all sides about the ineffectualness, the unsuitability, the evil designs, etc., of the persons elected to the Central Committee, but we hear absolutely nothing about the shades at the Congress that fought for predominance on the Central Committee. To me it seems indecent and discreditable to go about talking and gossiping outside the Congress about the qualities and actions of individuals (for in ninety-nine cases out of a hundred these actions are an organisational secret, which can only be divulged to the supreme authority of the Party). To fight outside the Congress by means of such gossip would, in my opinion, be scandal-mongering. And the only public reply I could make to all this talk would be to point to the struggle at the Congress: You say that the Central Committee was elected by a narrow majority. That is true. But this narrow majority consisted of all who had most consistently fought, not in words but in actual fact, for the realisation of the Iskra plans. Consequently, the moral prestige of this majority should be even higher—incomparably so—than its formal prestige—higher in the eyes of all who value the continuity of the Iskra trend above the continuity of a particular Iskra circle. Who was more competent to judge the suitability of particular persons to carry out the Iskra policy—those who fought for that pol icy at the Congress, or those who in no few cases fought against that policy and defended everything retrograde, every kind of old rubbish, every kind of circle mentality? Note: This footnote has been moved into the body of the document. Mountain and Gironde—the two political groups of the bourgeoisie during the French bourgeois revolution at the close of the eight eenth century. Montagnards, or Jacobins, was the name given to the more resolute representatives of the bourgeoisie, the revolution ary class of the time; they stood for the abolition of absolutism and the feudal system. The Girondists, in distinction to them, vacillated between revo ion and counter-revolution, and their policy was one of compromise with the monarchy. Lenin applied the term “Socialist Gironde” to the opportunist trend in the Social-Democrati” movement, and the term “Mountain”, or proletarian Jacobins, to Lhe revolutionary Social-Democrats. The Voronezh Committee and the St. Petersburg “Workers’ Organisation” were in the hands of the Economists and were hostile to Lenin’s Iskra and its organisational plan for building a Marxist party.